Ahead of our 2019 Channel Xperience Day in Amsterdam, Aerohive’s own Alan Cuellar Amrod (Senior Vice President and General Manager – Products and Marketing) was interviewed by Vincent Everts about a multitude of topics ranging from 802.11ax, Machine Learning, AI, Atom AP30, Aerohive Connect, and more. Speed is just a biproduct of 802.11ax. It’s really about extending battery life. Most of the previous amendments to Wi-Fi were actually done by the network manufacturers, but 802.11ax was really driven by the device manufacturers because there weren’t any tricks left to get more battery life out of 802.11ac. So now, they’ve embedded changes to 802.11ax to allow all kinds of wake-on and power-saving efforts since mobile devices are the norm, making the lives of those connected to the network much easier. Smarter channel management is another huge benefit of 802.11ax. The new channel sharing you get with 802.11ax allows high density to be served much easier. You don’t need the specialized design you needed in 802.11ac. Ax already comes with more capacity channel sharing capabilities to handle higher density since high density is the new normal. Aerohive is not just a Wi-Fi company. Shifting completely to cloud management with machine learning and artificial intelligence, Aerohive is not just managing Aerohive devices. We’ll manage almost anything that through our sensors, machine learning, and artificial intelligence, is reachable through standard network protocols and can then visualize those in relation to our network as well. Anything that has to do with Wi-Fi, and eventually switchers and routers, we can manage – yes, including your 4G and 5G cellular devices. 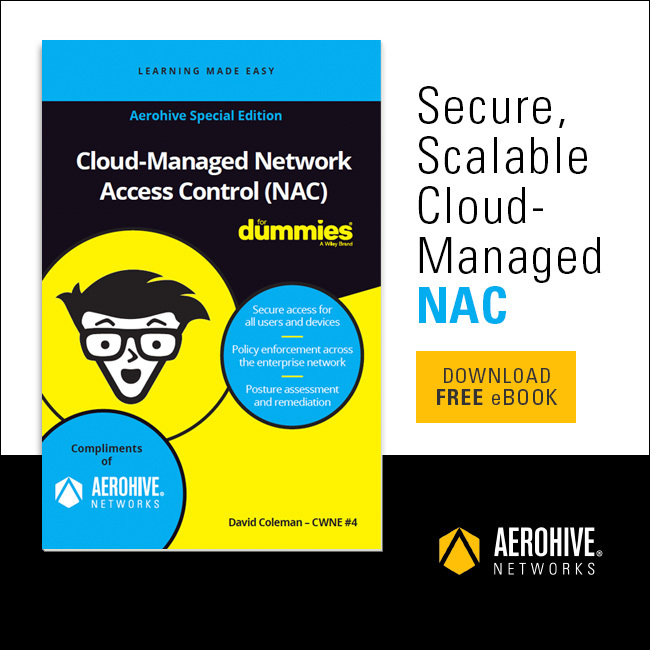 Designing and managing your Aerohive network is as easy as being on autopilot. When designing your network with Aerohive, you’ll only need to do the most basic of configurations and then the machine learning and artificial intelligence combination will actually self-optimize the network for you. Even with the complexity of BYOD increase, the network will self-segment and self-alert and identify a device based on device behavior, type, and user profile. The networks are increasingly more intelligent and all about associating common behaviors. Aerohive also has its own autopilot coming out. Once you get the network to the desired level, our autopilot function allows you to lock the network so no one can make changes or deviations that might negatively impact performance or client experience. Aerohive has an enterprise-grade pluggable access point that allows you to connect to your corporate network from anywhere in the world. The Aerohive Atom AP30 is a small, enterprise-grade pluggable access point that you can literally take anywhere that allows you to connect back to your corporate network. Ceiling-mounted access points are usually not enough. Our Atom AP30 not only services clients but acts as a sensor as well.